we heart romantic lace-edged veils! kemi customized a gorgeous manilla style veil (translation- not gathered at the comb, instead it drapes elegantly over the head, more like a scarf silhouette), with beautiful French Alencon lace. she chose a spectacular 10 foot cathedral length for dramatic beauty, and chose to pair a delicately scalloped lace at the top of the veil, with a wider, bolder lace on the cascade of the veil. breathtaking! 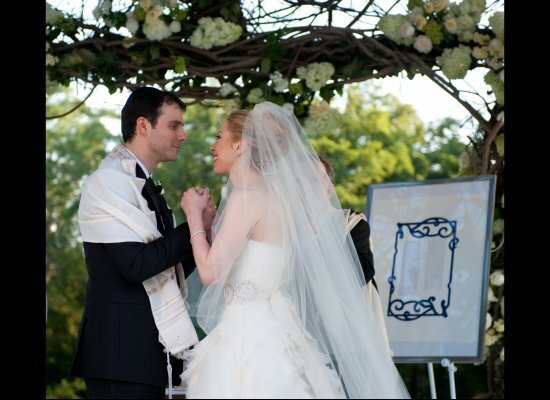 we heart chelsea clinton’s dramatic wedding look! we know everyone is talking about it, but we couldn’t resist. her wedding was fabulous. 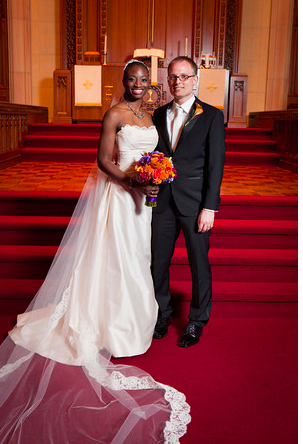 she looked stunning, and her man was adorable, as well. and who wouldn’t love a wedding in the romance and beauty of the rich east coast? but let’s talk about her look! the dress was stunning, with beautiful, regal pickups that made her look statuesque and beautiful, and had a stunningly detailed waistband that made the look truly extraordinary. she topped it all with a veil, and oh, what a veil! she went for high drama with a floor sweeping chapel length piece, which she chose to femininely drape over her face, as her father walked her down the aisle. stunning!